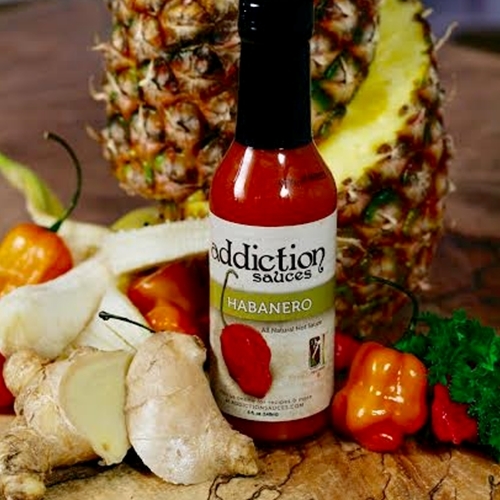 Our Habanero sauce is a vinegar-based sauce that has been well balanced with not only heat but also flavor. We start by using the natural sugars in the pineapple, which lends a sweet but tangy flavor; the banana adds richness, depth of flavor and a little fresh ginger to add another dimension to your palate. We finish with the perfet amount of pepper to allow you to experience the flavor and heat of the pepper balanced with the natural sugars and vinegar to bring you a well-rounded sauce. Our goal is for you to be able to experience the sauces as well as the food you eat it on! 3rd Place Winner of the 2013 Fiery Food Challenge in the Louisiana Style Hot Sauce!